Our first stop was to the Firsherman's Memorial where I made a more typical shot of this famous statue. The second stop was to visit our friend the peregrine falcon at Gloucester Town Hall. When we arrived it was just starting to eat its afternoon meal of fresh pigeon. We quickly readied our cameras and documented the meal. This is one of the behaviors that I had hoped to see when we watched the falcon for about an hour on Saturday. As the raptor ate, I snapped a number of photos. Some more gruesome than others. I was particularly impressed by the size of its talons. The peregrine made quick work of the pigeon, eating everything including the bony legs. This image shows the peregrine falcon stretching some tasty intestines. Yum! 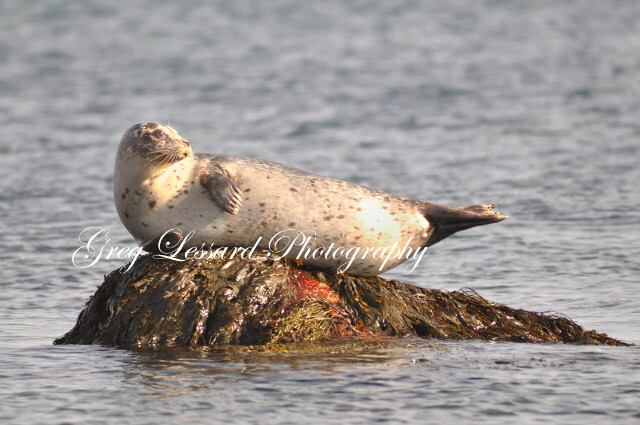 It soon returned to its sleepy, napping pose that it had displayed a few days before. Its all about timing! Of particular interest to me are the patches of blood on the underside of the falcon's tail. My guess is that the falcon had gripped the pigeon to the underside of its body as it flew to its perch, causing the blood of the pigeon to stain the white feathers of the falcon. My dad thinks that the falcon may have been mating with its partner, which may have caused some bleeding. If anyone has any idea what caused the blood stain under the tail feathers, I would love to hear it! My dad inspired me to create this image. He had recently been to Gloucester at sunrise and captured a nice silhouette of this famous statue. 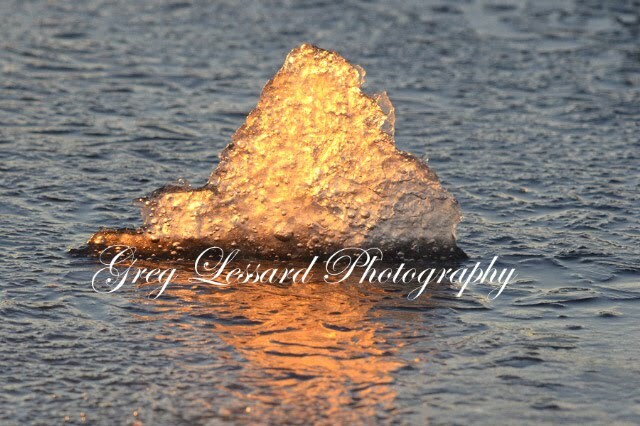 His image was outstanding, so I convinced him to go with me again at sunrise. While we were there, we met Dave, a local Gloucesterman who spent nearly an hour chatting with us. 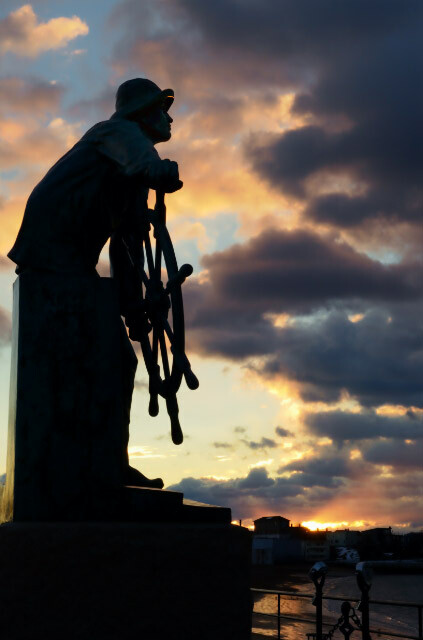 He knew the history of his town quite well and joyfully shared it with us. This image is one of the few that I have used HDR with. There was a lot of contrasting exposure values to this image. In the end, I didn't get all of the details. I elected to clip some of the cloud colors to avoid having the image look over processed. HDR often has a cartoon like quality that I usually don't prefer. I tried to make this image look more realistic and less garish than some HDR images appear. 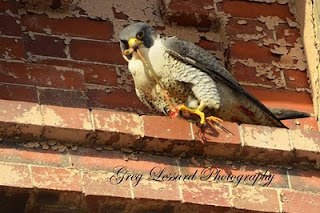 Shortly after I created this image, we went to the town hall and spotted the peregrine falcon from the previous post. Not a bad morning! 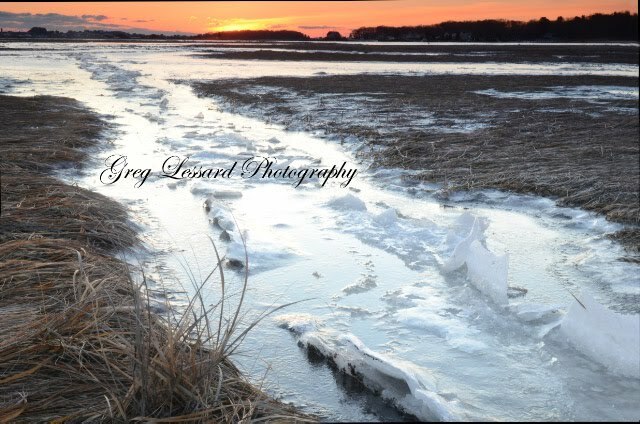 My dad and I went to Gloucester today for some birding and photography. 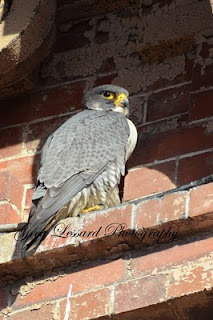 We were fortunate to find one of the peregrine falcons that has been regularly reported on the Mass Birdering List http://birdingonthe.net/mailinglists/MASS.html#1293805277 We found this beautiful raptor at the top of Gloucester Town Hall. It was sheltered from the fierce winds on three sides by the old building. Yet it still commanded a great view of its surroundings. The falcon would nap for brief periods of time and then peak over its shoulder to keep an eye on the neighborhood. I suspect that it must have eaten fairly well before we arrived, because it showed little interest in passing pigeons. On Friday, my dad found the remains of a pigeon carcass near the town hall. There is little doubt as to how it died. My dad and I watched this falcon for nearly an hour. During that time it showed very few interesting behaviors. It mostly napped. 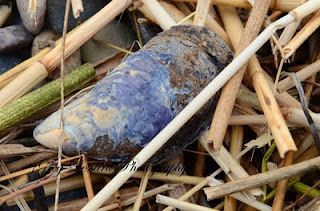 It did perk up when a flock of crows arrived on the scene, but that didn't even warrant more than a brief look around before it returned to its nap. 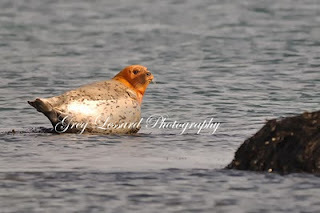 This was a life bird for me and only the second time my dad has seen one in the wild. Here are a few more shots from last weekends sunrise sessions at the North River. 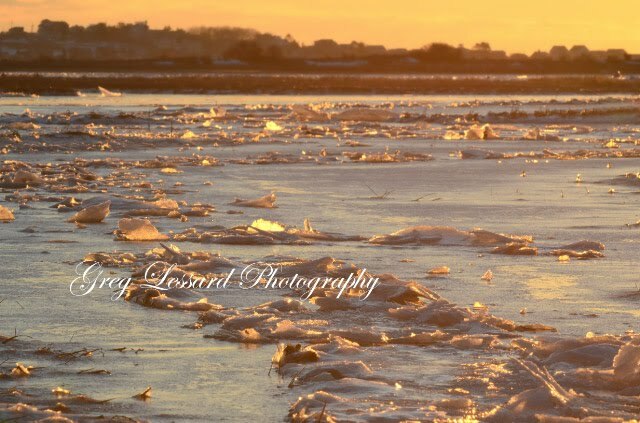 The ice on the marsh reminds me of vast ice fields in the arcitic. They contrast nicely with the warm sun. 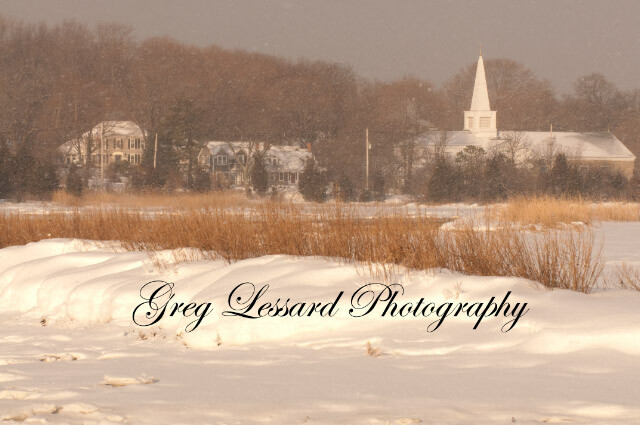 The buildings in the background are the village of Humarock. This weekend I was able to visit the North River in Scituate, Ma. 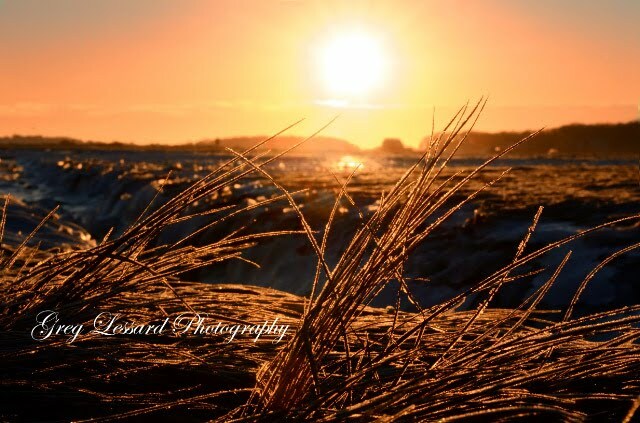 for some sunrise photography. The marshes surrounding the North River were frozen providing beautiful ice fields and a unique perspective. 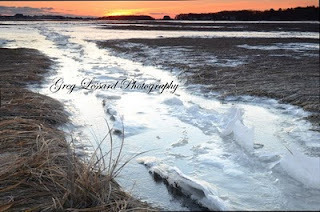 I was able to walk on top of the frozen marsh to find a composition that I would never approach in warmer weather. 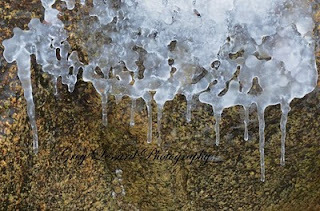 I probably would have sunk up to my knees in muck if the ground had not been frozen. 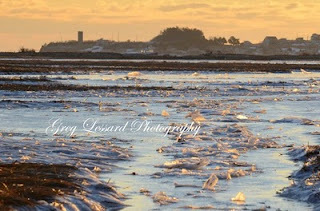 I was fortunate to be there just after low tide. A couple of days later, the spot where I stood was underwater at high tide. With temperatures around 5 degrees Farenheit, that would have made for a particularly cold morning. Only 1 Spot Left on the Montana Trip! 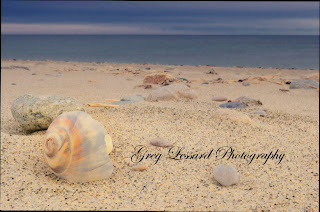 This morning I led another tour to Duxbury Beach. It was the fourth time I have been out this winter with a tour. It was a tough day to spot wildlife. The air temperature was cold and the wind was strong. Yesterday's seals did not come out to sun themselves. We did see a beautiful harrier making its rounds. 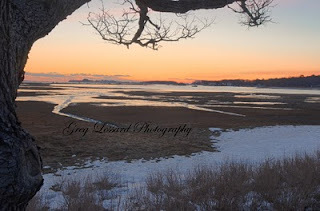 With the lack of wildlife, we went to work on the landscapes of Duxbury Beach. My favorites today were some macro shots. 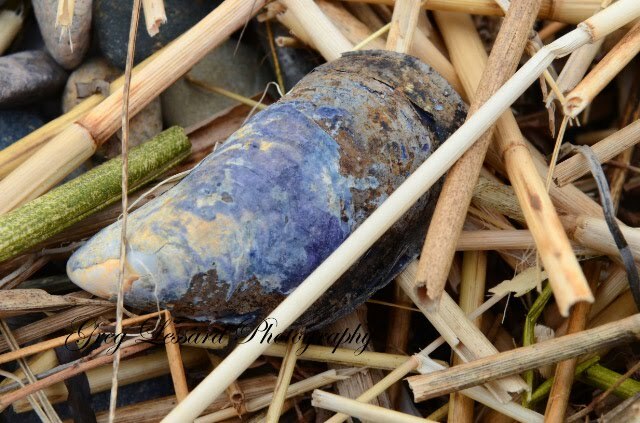 All of the winter storms have pushed a lot of debris onto the beach. Some of it is photogenic, some of it not so much. So, I focused on the minute details. 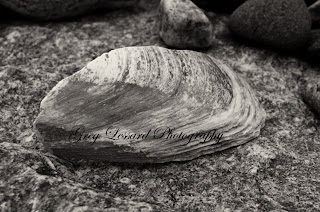 Today I led a photo tour to Duxbury Beach in conjunction with John Galluzzo and the Mass Audubon Society. On the tour we saw a number of harbor seals that were sunning themselves on some rocks. With some patience we were able to get fairly close to the seals without disturbing them. That is no easy feat for a group of 14 photographers! One of the seals had a distinctive red head. 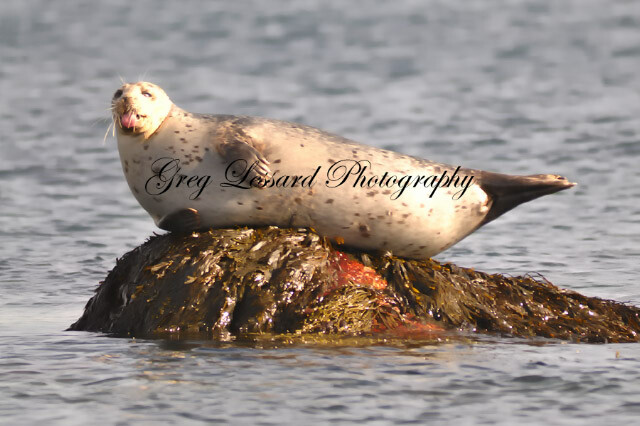 Another seal habitually stuck its tongue out at and waved at the camera. They all made for a fantastic tour! 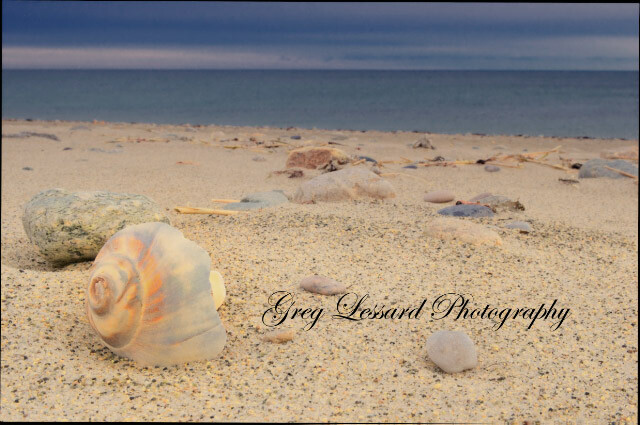 This image was made from Peggotty Beach in Scituate. With the snow falling on the church and the colonial houses, Scituate looks like the classic New England village. The rare combination of falling snow and bright sun made for a very intriguing composition. This image is a classic example of shooting on the edge of a storm. Storm light is often fantastic, with bright sun and dark clouds providing amazing contrast. 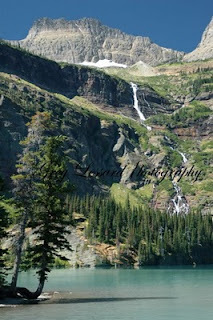 I have donated a 12x18 print of this image to Andrea's Art Auction. This auction will be held on Saturday, February 12 at the Barker Tavern in Scituate. The proceeds of this auction will go to the Jimmy Fund. 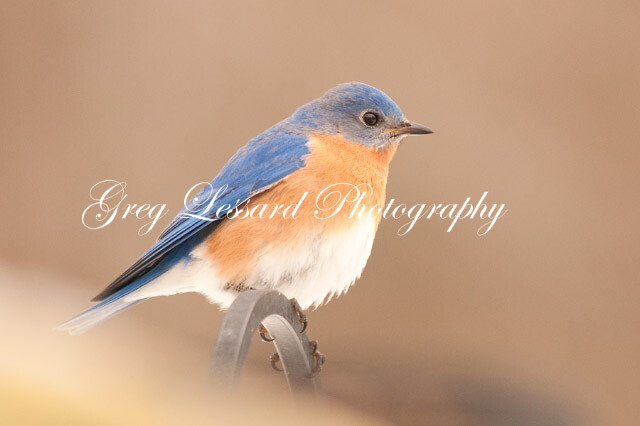 Yesterday I was fortunate to get close to a flock of bluebirds that has been visiting my neighborhood. They have a circuit of cedar trees and rose bushes that they fly back and forth to in search of food. 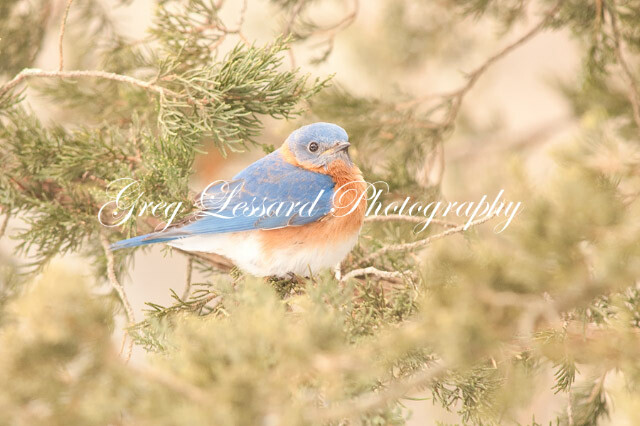 The cedar berries and rose hips are particularly helpful to bluebirds in the cold winter months. One of my neighbors has also started to put out meal worms for them. With the threat of a coming storm, all species of birds were busy eating as much food as they could. 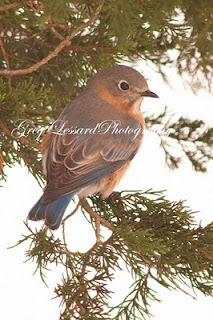 The bluebirds were flocking together with robins, cardinals, goldfinches, titmice, nuthatches, sparrows, a pine siskin and a small army of squirrels. I was thrilled to be able to get close enough to make a decent image of the bluebirds. They are a particularly wary species and it can be a challenge to get near them. I stood about ten feet from some cedar trees and patiently waited for them to fly to the trees. After about an hour, they had traveled their circuit about four or five times. Then they began to congregate at my neighbors house where they were finding free meal worms. The bluebird is one of my favorite species. When I was a kid, they were fairly rare. Their numbers had been decimated due to loss of habitat and the use of pesticides. 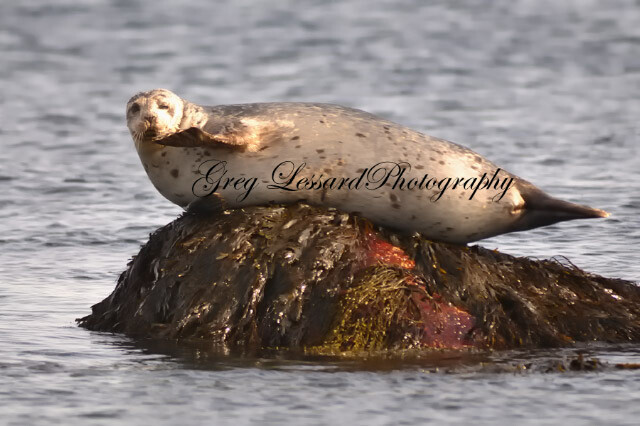 Today there numbers are increasing and they can be found much more easily in Southeastern Massachusetts. I still remember the first time I saw a bluebird. I was hiking through Pratt Farm, a local park in Middleboro, with my best friend Ben. We were in high school and would go fishing at every opportunity. As we were passing through a meadow in the late afternoon, a tiny electric blue bird buzzed by us. Then a few more went by. We stared at each other and wonderd what they were. Both of us were familiar with the common birds of the area and neither of us had seen this kind of bird before. After a moment's consideration, we decided that they were bluebirds. To this day I am still fascinated by their brilliant blue plumage! With a two hour delay for school today, I took advantage of the extra time for some photography around Marshfield and Scituate. When I was leaving Peggotty Beach, a cooper's hawk landed on a telephone pole above my car. I grabbed my camera, opened my sun roof and he was gone. I missed the shot. I watched the hawk fly across the marsh lands and back towards the first cliff area. I was disappointed to miss the shot, but thrilled to see the bird. 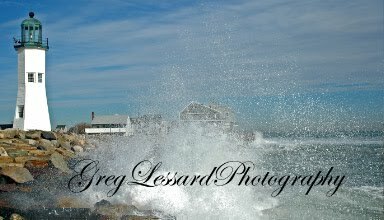 Continuing my morning photo shoot, I went to see how Scituate Light looked across the harbor. The light at that point was pretty grey and flat so I turned around to head back to school. As I got to the top of first cliff, I saw my pal the cooper's hawk fly on top of a hedge less than twenty feet from my car. It was chasing a sparrow. Soon the hawk dove into the hedge after its prey. I never imagined a hawk would go into hedges after a sparrow. The small, maneuverable sparrow easily escaped the hawk. The tenacious cooper's hawk didn't give up. It spent the next five minutes moving through the hedge looking for other sparrows. One of the sparrows nearly flew into my head as it escaped. The hawk eventually left the hedge and flew down the road. I headed in the same direction hoping to catch a better view. This time the hawk was sitting in a tree surveying the local bird feeder. Finally, I made a decent image. After posing for a few frames, the hawk flew off to continue its morning hunt. I believe this is a juvenile cooper's hawk. The rounded tail feathers and barred chest are classic cooper's hawk characteristics. The yellow eyes and the brown feathers on its head identify it as a juvenile. 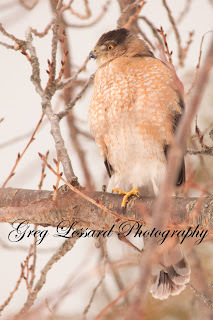 Adult cooper's hawks usually have red eyes.